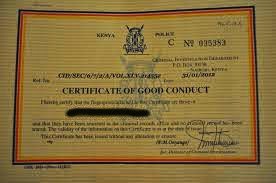 If you used to reside in Kenya a while ago, have since left the country but find yourself in need of a Kenya Police Certificate of Good Conduct/Kenya Police Clearance Certificate, you don't need to travel back to Kenya to get one. You can apply for one from your country of residence. Your fingerprints and palm prints must be recorded on a prescribed form at the nearest Police Station in your country of residence. Visit the nearest Kenyan embassy or consulate and pay Kshs 1000 or its equivalent in your country of residence and obtain an official receipt from our foreign mission. Alternatively submit a cheque payable to "Director of Criminal Investigation" at Nairobi, Kenya. Provide a certified copy of your country’s passport with documentary proof that you have ever resided in Kenya for 6 months or more. The application consisting of original payment receipt or cheque, certified copy of passport, document of proof of residence in Kenya and fingerprints must be forwarded officially with a covering letter from the official fingerprinting agency or Kenyan mission to the Directorate of Criminal Investigation Headquarters in Nairobi, Kenya.